bounded by Atlanta in the north and Newnan in the south. The Roscoe–Dunaway Gardens Historic District is a rock and floral garden located around the historic town of Roscoe in Coweta County, Georgia and the adjacent Dunaway Gardens. 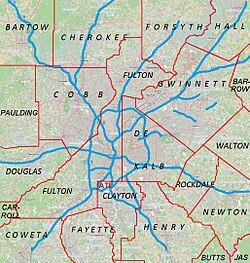 Part of the district is located in Fulton County. 79 buildings and 2 structures contribute to the historic district. This page was last edited on 4 July 2017, at 19:30 (UTC).